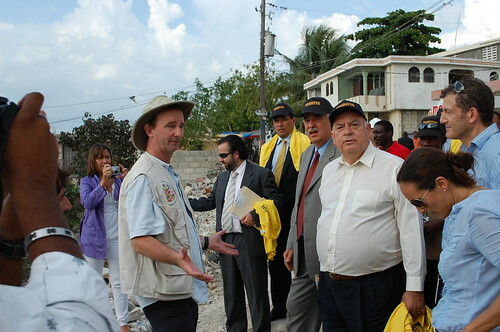 As I rushed relief supplies from the Pan American Development Foundation through the streets of Port-au-Prince just after the devastating Jan. 12 earthquake, I could not fathom how Haiti would recover from the worst humanitarian disaster in the history of the Western Hemisphere. Nearly a year later and on the other side of the world, I saw what could be Haiti's future. In October, I traveled to Indonesia with a World Bank study group to see how that country recovered after the post-Christmas 2004 tsunami, which killed in excess of 200,000 and leveled some 139,000 homes, and the 2006 Yogyakarta earthquake, which took the lives of more than 5,700 and damaged 175,000 buildings. Back in Haiti--touring the Delmas 32 housing repair project with the OAS Secretary General and the PADF team. Over four months ago, I drove away from Haiti thinking I was finished. I didn't make it very far. I know support PADF's Haiti operations from our Washington office. Although I spend a good bit of time in Haiti--next week will be third visit in two months--the view from Washington is quite different. The biggest difference is distance--both geographic and personal. I am typing this in my Rockville, Maryland house far from the hassles and stress of Port-au-Prince. Although I spend a good part of my days working directly with our Haiti office through phone calls and emails, I don't live the experience any longer. This geographic distance makes things much more personal. I was talking with our Country Director when the storm went through last Friday. It was an immediate threat to him and to those around him. For me, it was a logistics question--how could we mobilize any support to help.